One of the biggest plusses of working in Social Enterprise and in the Homelessness sector is the fantastic people I get to meet. When I say fantastic people I mean contributors, I mean people who give something of themselves for the benefit of others and Jeanni is one of those people who in my estimation sits very high up. Jeanni was recommended to me by an old friend when I was putting together a pilot Life Skills Programme for the House of St. Barnabas in Soho and when we first met I was intrigued. Jeanni claimed she could get anyone producing great art in a very short space of time and yesterday I found that claim to be absolutely true! 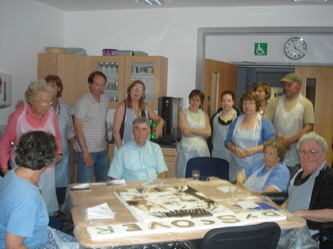 Jeanni agreed to contribute a workshop to the Life Skills Programme on an expenses only basis and not only did she validate her claims of getting anyone to produce great art she provided a workshop that can truly claim to have the power to transform. She challenges a very basic human function, the way we view the world around us, the way we look at things! She unpicks learned behaviour through art and demonstrates in a way I've never experienced before that we are all capable of so much more than we realise. If you need to bring fresh thinking into your life or business save yourself a lot of money on expensive therapists and consultants and buy some time with Jeanni. I can safely say you will not regret it. This woman does what it says on the tin and more!
" Active 8 had a very successful workshop with jeanni. 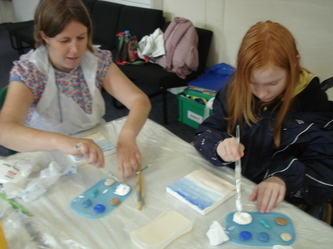 We are a charity for young people with physical impairments and her art session managed to include everybody at a variety of ability levels. 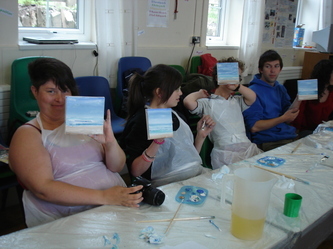 Everybody came out with a piece of art work to be proud of and we really enjoyed it! Thank you!" 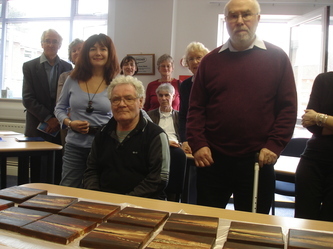 "Jeanni recently made a welcome return to Dyscover to run a series of three Art Workshops, with a group of our Members and some of their relatives. 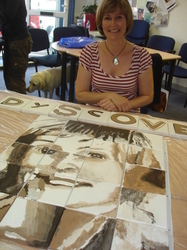 Dyscover is a support group for people with Aphasia, a communication difficulty usually caused by a stroke or head injury. 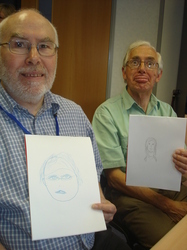 Understanding, speaking, reading and writing may all be affected, though intellect is not; people with aphasia are competent adults. 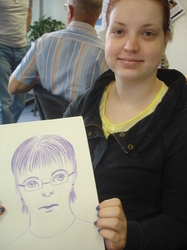 Jeanni is sensitive to everyone’s needs and is very good at communicating her enthusiasm and skill to the group. 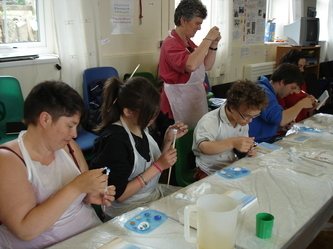 She enables everyone to participate fully during the sessions creating challenges for each person, and building confidence in their own abilities. 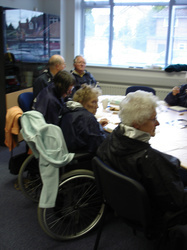 The feedback we have had from the group has been very positive; one member said “It was absolutely brilliant! When are we doing it again?! 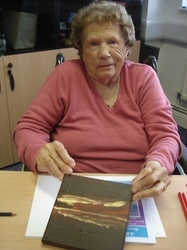 The Warrior Programme was delighted when Jeanni carried out a magical art session with homeless people and ex servicemen. 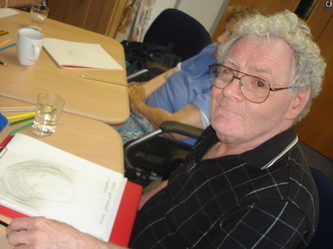 The experience helped restore their self esteem by seeing first hand what masterpieces they could create in such a short space of time, thanks to Jeanni’s innovative and fun approach to teaching art. Thank you for your generous donation to our recent auction for Merlin. You have helped us to raise just over £5000! 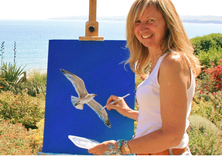 Cornwall Air Ambulance Trust are glad to have Jeanni on board helping us to raise much needed funds to keep the helicopter flying over Cornwall and the Isles of Scilly by using her skills as an artist. We are a charity for ALL people in need and have been serving Cornwall & IOS since 1987. Cornwall Air Ambulance is entirely funded by the local people.